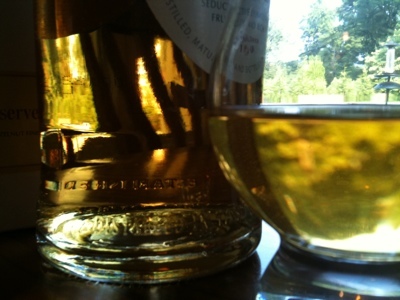 The Coopered Tot: Glen Grant Major's Reserve - a light fruity, floral, summer dalliance. 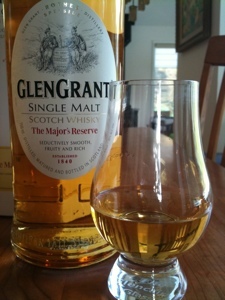 Glen Grant Major's Reserve - a light fruity, floral, summer dalliance. 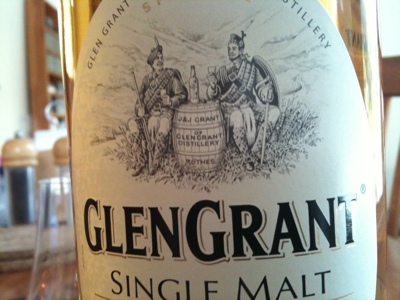 Glen Grant is a great old name in Scotch - dating back in the early half of the 19th century (1840 says the label). It bears the family name of John and James Grant, also the guys who started Caperdonich. Glen Grant is located in Rothes in the heart of Speyside. It has bounced around a lot over the years. It was part of Chivas, then Glenlivet, Pernod Ricard... Since 2005 it has been owned by Campari. There has been some talk of increased use of caramel coloring, but there are many distinguished bottlings from this distillery that is famed for its high stills, pale coloring, floral and fruity Speyside aroma, and excellent ability to age in cask for long periods and continue to get better and better. Glen Grant is, according to materials I received from Danielle at Exposure (a company doing some marketing for Campari who also provided the bottle for my party today - thanks Danielle!) the 5th largest selling single malt whisky in the world, and the leader in Italy. This latter fact is presumably important to Campari. Aging is a big issue for the Scotch distillers of today - because demand is up and production of new make doesn't help expand stocks at great age for age statement expressions. A common strategy - one that has engendered a lot of discussion and hand wringing - is the release of No Age Statement (NAS) expressions. 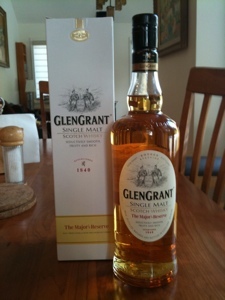 Glen Grant's NAS expression is called The Major's Reserve. It has been out for a couple of years in Europe, but is new in the US and this Sunday the first big marketing push began. In fact, Glen Grant Major's Reserve, is only currently available in limited markets in the US: CA, NY, NJ, CO, FL, AZ, TX, IL, MD & MI. Its suggested retail price is a remarkable $29.95 - which makes it among the lowest priced single malts in America - and is priced lower than many popular blends. This is fantastic if it's good to drink. Stir ingredients. Pour over ice into punch bowl. Contains approximately 10 servings. Shake, strain into a collins glass over ice. Top with club soda and a sprinkle of salt. I wasn't able to make it to The Drink, today, however - but I put GGMR to a strict test: a pool party with 30 people including a good mix of non-whisky drinkers and women. We had GGMR straight, with ice, mixed into highballs with soda & orange bitters, and with ice and water in Japanese-style mizuwaris. GGMR in the glass - neat. Glen Grant The Major's Reserve 40% abv. 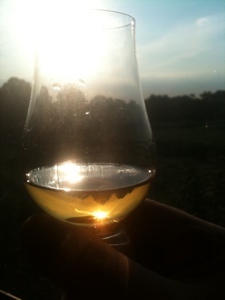 Palate: light and gently sweet on entry. There's plenty of spirit heat and a low density of flavor so it comes off as young, but the flavors that are present are very nice: honeysuckle florals, white and green fruit (pear, honeydew melon), some grassy meadow flavors and a hint of mineral. I suspect there are some nice more matured malts in the vat here to bring more distinguished Spey/Highland flavor notes to the party. The turn to the finish sees the spirit heat tingle eclipse the sweetness and a malty herbal bitter wash fills in behind. Very little oak on the palate - more testament to youth. A splash of water sweetens the nose but loosens the already too-light palate until another 15 minutes or so enriches it again - a bit. Amazingly the sweet and floral nose remains prominent - clearly apparent and enjoyable even in the watery environs of a mizuwari - while the palate washes into a light slightly sweet wash. GGMR was a hit at the party. Everyone enjoyed their whisky and no one complained at all. It held up quite well in the summery party setting. Never one to be complacent, I looked around in my cabinet for other entry level NAS single malts and popular blended Scotches to compare head to head. I alighted on the following: Glenrothes Select Reserve (GSR), Great King St. Artist's Blend (GKSAB), and my habitual touchstone: Johnny Walker Black Label (JWBL). All are better than I remember - taken on their own terms (i.e. don't look for huge density of flavor). All are strikingly different from each other. GGMR is a Glenfiddich-like Spey sweet and fruity thing. JWBL is almost peated by comparison - with a much darker cast, more oak, richness, malt foundation, and greater weight as well as a clear peat note. GSR is the least sweet, and had a slight sulfur off note at first that burns off after 15-20 minutes in the glass. Then GSR becomes almost apricot & old oak like an old 80s Balvenie. Sadly a trace of the off note remains. GKSAB is lemon curds and creamy custard - fresh and light. I went back and forth, my opinion shifting, until my head started to spin a bit. Final ranking 1) JWBL - wins by virtue of best balance and greatest flavor density 2) GKSAB - by its high malt content, fresh flavors, and nice balance 3) GGMR docked for spirit heat rawness in the mid-palate, but stands very well because of its superior nose 4) GSR - trails because of the slight off note but distinguishes itself by having an usual tartness and mature wood quality. On the whole it was much closer than these rankings suggest. Each had their charms and each was quite distinct. GGMR almost won on the floral perfume angle. It had the freshest and most perfumed nose and didn't embarrass itself by any means. If you're interested in a light floral Speyside dram with a hint of the mature Speyside fruit basket aroma and flavors and don't mind a bit of spirit heat and a very light touch on the mid-palate - GGMR's a very cost effective option. It's not a rich or stunning malt from an epicurean perspective, but this gentle mixable malt sins primarily by omission rather than commission. It is better than expected and I have no compunction recommend it to people looking for an inexpensive introductory malt which mixes well and plays with ice nicely for a refreshing summer tot.